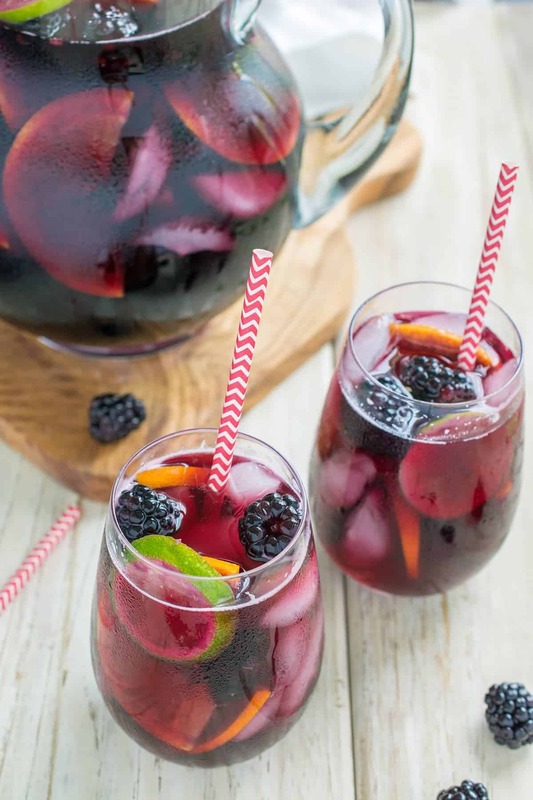 This refreshing Summer Blackberry Sangria is the perfect, easy summer cocktail to serve at an intimate gathering or for a crowd. This make-ahead punch blends red wine, brandy, and plenty of summer fruit flavors. 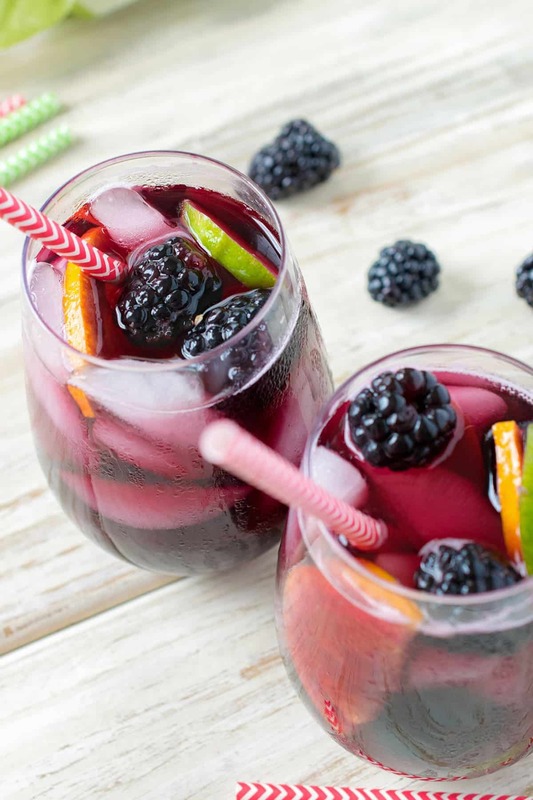 Oh yes, Blackberry Sangria and the lazy days of summer go together perfectly! It’s 95 degrees this weekend in our neck of the woods but the breeze is keeping the temperatures from feeling overwhelming. It’s a perfect weekend to sit back and enjoy some of my favorite Sangria recipe on the deck, especially at night on the deck with our new lights. 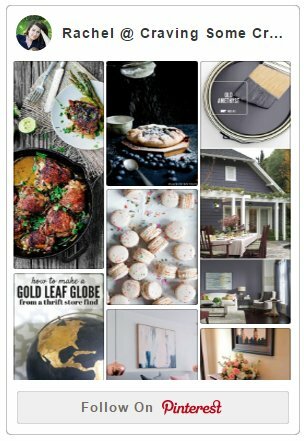 *This post may contain affiliate links to products I use and adore. All you need for this sangria is a good dry table wine, brandy, fresh fruit, and some ginger ale. You can boost the blackberry flavor by making your own blackberry simple syrup. However, sometimes, it’s been a long week and I skip it and simply add the sugar to the wine as is. The sugar can be harder to dissolve in the wine directly so stir quite a bit. Your choice, as both are very delicious! Looking for more Summer Treats? Look no further! This is an easy cocktail to make for large parties because it only has a few ingredients and is easy to double or triple. Plus, everyone always enjoys it! For best results allow the sangria to set overnight. The fruit has more time to infuse into the wine and you can adjust after it has had time to sit. As the flavors meld, you will notice that the sangria will get fruitier and sweeter. I always add the ginger ale just before serving. If you want a stronger wine taste, add less ginger ale and more if you want a more of a fruity punch taste. Insulated Wine Glasses with Lids– Perfect for the hot outdoors and protects your drink to boot! 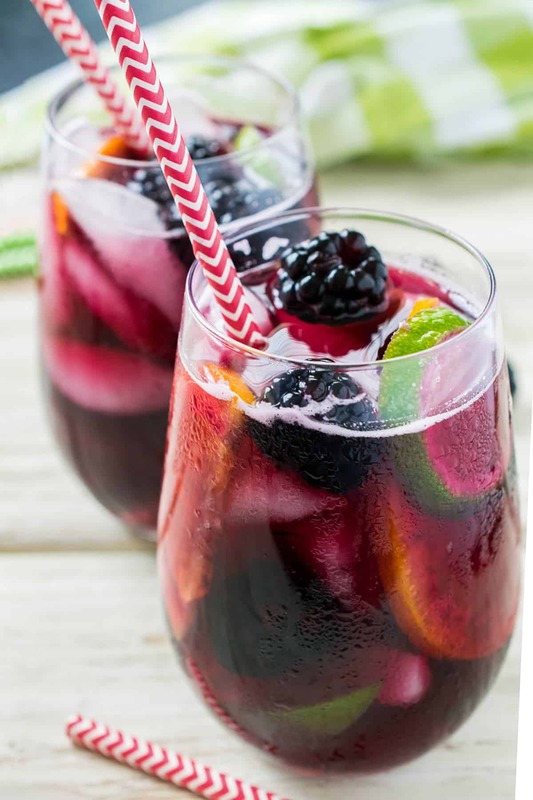 The Perfect Sangria Glasses – these stemless wine glasses are perfect for sipping! In a small saucepan, add the water and sugar. Bring to a boil for 2-3 until sugar is dissolved and the water is clear. Add in blackberries and simmer for about 10 minutes or until the blackberries are mushy. Transfer to the cheesecloth and squeeze all of the juice into a small bowl. If using a mesh strainer, press down to get most of the juice. Allow to completely cool before using in the sangria. In a pitcher or desired serving dish, add the wine, brandy, blackberry simple syrup from above, and all the fruit. Allow to sit overnight in the fridge to fully infuse the fruit flavors into the punch. Add the ginger ale and ice just before serving. If you want to skip making the blackberry simple syrup, add the 2/3 cup of sugar to the room temperature wine before adding the fruit. Stir until completely dissolved. Great Recipe! Thanks. I didn’t use the simple syrup, but crushed up and strained some extra blackberries. This was one of the best sangrias I have ever had! Served it at a party. Solid summer or winter sangria. Added club soda just before serving for a little fizz and decorated with one whole blackberry. Will definitely make again.